GOAL 1: Identify appropriate technology resources for posting existing and new information and making the information searchable. GOAL 2: Develop a survey to prioritize needs. GOAL 3: Based on prioritized needs, develop workshops, webinars or presentations, compile existing resources. GOAL 5: Behavioral husbandry committee will curate that section of the TAG meeting, by soliciting and selecting presentations, hardest to fill on the agenda. The BHC exists to enhance the professional collaboration of ungulate behavioral husbandry. Vision: To increase ungulate welfare through behavioral husbandry innovation. Committee focus: New training programs - working from the "ground up"
Amy has been in the zoo field for 15 years. She received a B.S. from the University of Wisconsin-Stevens Point in Wildlife Management and Biology, and minored in Captive Biology. She has a strong interest in Applied Behavior Analysis, and has worked over the years to gain as much information as she can on training with positive reinforcement techniques. She has taken courses from Behavior Works (LLA), participated in and has helped run training workshops, and regularly attends the Animal Behavior Management Alliance’s annual conference. 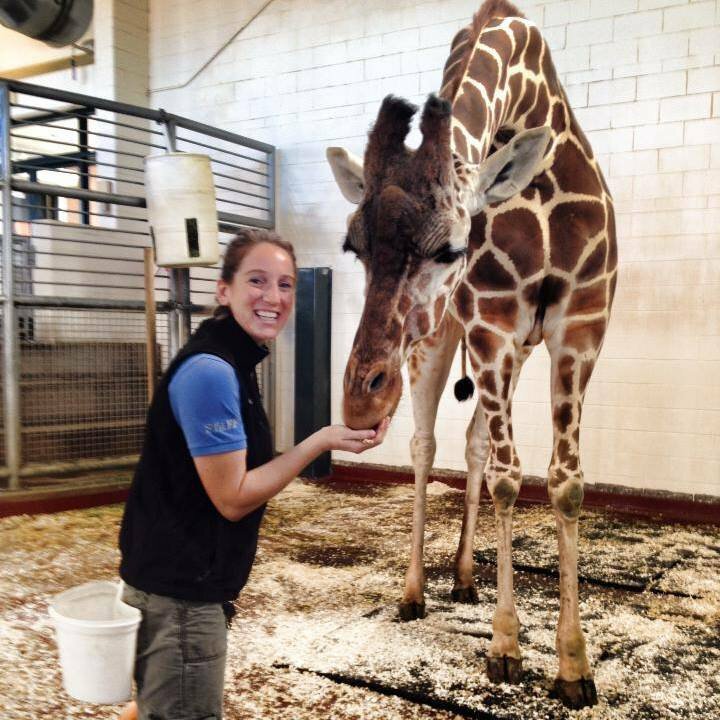 She currently works in the African Rift Valley section of Cheyenne Mountain Zoo with a variety of animals. She oversees the giraffe hoof care training program for the zoo, and hosts a Giraffe Care Workshop with the intent of forming a community of giraffe care professionals who can work together to solve issues. She is looking forward to working with the Ungulate TAG’s BHC in the same capacity. Amy Phelps has worked in the zoo field for 18 years and has focused most of her career with ungulates. During her 16 years at the Oakland Zoo she developed an expertise in giraffes where she specialized in geriatric care and hoof care. Along with her colleagues, she developed a positive reinforcement based training program that allowed giraffes to be active, willing participants in their own medical care, and pioneered an extensive holistic medicine and physical therapy program for the disabled and geriatric giraffes. This program produced many publications and garnered several awards from AAZK. She is a self-proclaimed “behavior geek” and has trained numerous species of ungulates in addition to giraffe including Addra gazelle, eland, zebra, bongo, warthog, and rhino. She loves to use training to demonstrate that ungulates are intelligent and unique. Throughout her career, Amy has worked closely with several giraffe conservation projects, identifying different ways in which the captive collection of giraffes can be effective ambassadors for their wild counterparts. She is currently the Curator of the Children’s Zoo and Animal Resource Center at the San Francisco Zoo. In addition to her zoo work, Amy is an avid martial artist and has a black belt in Kenpo karate. When she is not with the animals, Amy enjoys spending time her family, including her son, Boston born in 2016. Jordan is an active committee member of the Behavioral Husbandry Committee at Denver Zoo, a committee made of 15 animal keepers where we are resources for the rest of the staff while helping improve our BH program and overall animal welfare. While she has only worked at Denver Zoo, her experience with training ungulates is vast. Through positive reinforcement, her training experience includes but is certainly not limited to: voluntary hoof work, acupuncture, and physical therapy with lesser kudu and initiating and leading a training program for Denver Zoo’s Cape buffalo herd which had never been done at the institution due to the limited set up. Currently, she is finishing an injection behavior with one of the buffalo with hopes of training ultrasound. Denver Zoo recently revamped the enrichment program, which Jordan was a part of, and she developed an extensive workbook that details approved enrichment for hoofstock by species, safety restrictions broken down by enrichment processes, considerations when offered in mixed species exhibit, and a guide for proper observations and record keeping. She has also been a part of developing quality of life sheets and welfare trackers for the ungulate collection to provide advanced animal care. Melissa has been a zoo keeper for 15 years, and has worked at a total of 5 facilities: Wildlife Safari, Tampa’s Lowry Park Zoo, Disney’s Animal Kingdom Lodge and Animal Kingdom, the Denver Zoo, and currently Utah’s Hogle Zoo. She has experience with a wide variety of animal taxa, but most notably pachyderms and ungulates. She has worked with training and enrichment challenges in open range/free contact settings, mixed species exhibits, and have dealt with the challenges of implementing naturalistic enrichment, creative enrichment within a limited budget and “sky is the limit” enrichment. In 2014, Melissa attended the Shape of Enrichment workshop and learned a great deal of information there on the topics of safety, innovation, troubleshooting challenges, the 5 main categories of enrichment, scheduling enrichment, and effective time management for providing enrichment. Melissa has worked with elephants at 3 of her facilities and has been provided with ample opportunities for training new behaviors in a positive reinforcement setting. She has also worked with many species of hoofstock from small species like dik-dik and duikers to the mid-range gerenuk, nyala and bontebok, to the large guys like eland, bongo, roan, greater kudu and many more. She believes strongly in positive reinforcement techniques, and enjoys troubleshooting challenges with her curators and colleagues. Carrie has served as training team coordinator for her department and fulfilled several new initiatives at Brookfield Zoo. She has established electronic training logs in excel which include a rating system to help track progress. She has created a feedback system among keepers to monitor training progress. Carrie has free contact experience with camels for lead training, radiographs, scale training, and blood draws. She also has protected contact training experience with various hoofstock including warthogs, camels, zebras, bison, giraffes, and okapi. Some of the behaviors worked in protected contact settings include body positioning, tactile desensitization, scale training, targeting, hoof trimming, chute training, and trailer training. Carrie has recently led her team in establishing measurable behavior goals for each species in the area. The process follows the SPIDER model and includes natural history research followed by behavioral observations, with data entry and basic analysis through excel. Based on the findings of the observations the team has adjusted their management practices and enrichment calendars with the aim of meeting the established behavior goal. Allison Kao is the Behavioral Husbandry and Enrichment manager at the Lincoln Park Zoo in Chicago. She has been working in the zoo field for about eight years and during that time has taken great interest in the science of operant conditioning, solving problem behaviors and environmental enrichment. Allison has a strong passion for ungulates and has worked with many different species throughout her career. Some major accomplishments throughout her career include, training giraffe for voluntary hoof trim, blood draw, x-ray and chiropractic care. In addition, she has coached zookeepers in completing a variety of voluntary medical and husbandry behaviors with Giraffe, Takin, Zebra, Rhino, Camel and Red River Hog. Allison believes the care of ungulates can be greatly improved with proper implementation of positive reinforcement training and a strong goal-based enrichment program. Allison is working closely with a behavioral monitoring program called Zoo Monitor to develop an enrichment evaluation program based off of natural behavior goals. Adam has been working at the Columbus Zoo and Aquarium since 1997. He began his full time career as a pachyderm keeper working with both African and Asian elephants and black rhinos. Between 2008 and 2013, Adam was promoted to Head Keeper and then to Assistant Curator of Asia Quest/Pachyderms assisting in managing the region’s collection, such as elephants, rhinos, sun bear, tigers, lions, and flying foxes. He played a vital role in many successful births, including the births of a rare black rhino calf, Amur Tigers, and two Asian elephant calves. During this time he was responsible for all elephant and rhino training, as well as played a major role in tiger, lion, and other Asian species training programs. Adam’s vision, experience, and expertise landed him the position of Assistant Curator of the new Heart of Africa Region in 2013. After months of collaboration to open a new region of the zoo (including planning, design, staff development, training, animal acquisition, and the occasional bottle feeding of baby zebra and Thompson’s Gazelle). In this role, Adam and his staff worked with other professionals throughout the country to learn and implement a top notch training program for giraffe and other ungulates. In this time the Columbus Zoo’s giraffe program has excelled. Adam is now the Curator of Asia Quest and Heart of Africa, and the chair of the Zoo’s training committee. Becca has been in the zoo field for 15 years. She received a B.A. from Wichita University in Wichita Kansas, with an emphasis in primate studies. Her interest lie in using enrichment and training to enhance animal welfare. She had attended the Giraffe Care Workshop at Cheyenne Mountain Zoo a few years back and really developed a passion for giraffe and began developing a training program for the giraffe and other ungulates. She is currently the Curator of Primates and Africa at the Oregon Zoo and oversees a variety of animals including a growing collection of ungulates. Becca has recently taken on the job of enrichment coordinator and is working to develop a database for the zoo’s enrichment program. She is very excited to be working with the Ungulate TAG’s Behavioral Husbandry Committee.